We are Red Lantern. Join the Conversation. Be the conversation. These days, people are content rich, and time poor. The bar over the quality of content that people expect is constantly being raised. Our team curates content that speaks to the right audience on the right platforms. We also know that letting an agency speak on your behalf in a certain territory can be very daunting for rights-holders and brands. We work very hard to make sure we are communicating with audience in the correct tone of voice, no matter the language. We put in place approval systems that make sure this is also a transparent process for the client. Content is being watched now rather than being read. Any content marketing strategy for Asia needs to be underpinned with best in class design work. Our design studio creates illustrations and animations which have been used globally by our clients. This artwork often engages audiences in local markets in a deeper way, whether it is reworking a local cartoon that let’s the audience hark back to their childhood, or artwork that may overlap with a breaking social media trend that day. We are seeing a convergence in the roles of content creators and computer programmers. The definition of what content is – is being stretched. We help clients build digital products to help meet their objectives, whatever they may be. These range from official apps and CRM solutions, to social games. We build these products in-house, or find the right specialist technology partner for you in market. Increasingly media spend is required to cut through platform algorithms and reach new audiences. In Asian markets such as China; the digital media spend market can be very complicated. From promoted content on Weibo, through to multi-platform programmatic marketing campaigns, we try to help our clients make the best purchasing decisions based on their desired outcomes. Our team has the experience to fully manage these campaigns for our clients. This service can also include the identification and activation of local market influencers. Finding out about what your brand means to a certain Asian audience is interesting. Often the associations they make with your brand and the visual identity will be different to core values that your organisation has. There are of course countless examples of branding disasters in Asia, where for example a company’s chosen Chinese name is at odds with how it wants its products to be perceived. We have an in-house agency process help make sure your brand or product – whether it’s new or established – is perceived in the desired way in your chosen Asian markets. Need to get some sports related content filmed in Asia? We have the team for you. 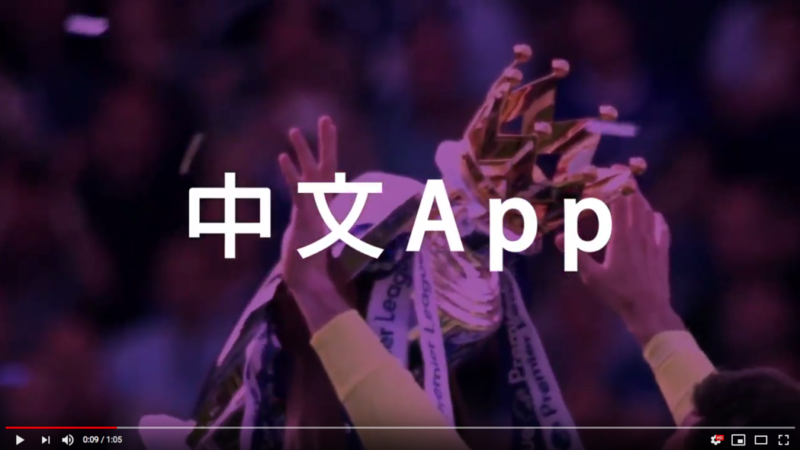 We have filmed content across Asia or some of the globes leading sports IP including: the Premier league, the Wimbledon Championships, Liverpool FC, and the PGA TOUR. Whether its short form vertical video for social, or longer format films, we have the experience to create engaging video content for our clients. We offer full stack video production including: directors, producers, camera-operators, script editors, post-production & graphics. 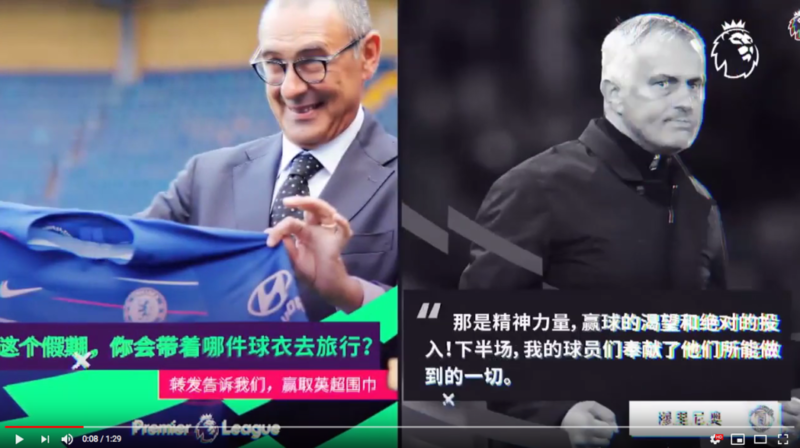 In late 2018, the Premier League launched its first-ever Mandarin official app in China. The launch took place at the China International Import Expo, an event which was also attended by Chinese premier Xi Jinping. Red Lantern organised the public relations strategy for this launch, a mixture of the engaging traditional media and online influencers. This was with the mixed objective of raising awareness of the launch as well as trying to drive uses towards download. Whatever your campaign, our team can help build a plan that is right for you. Reporting is a huge part of the services we provide. For us it is vital the client sees how we are performing for them in market. Whether that be interactions on localised social media content, or driving e-commerce transactions. We can tailor our reporting methods to fit with your company wide system. We tend to work on the basis of daily or weekly reporting updates, with deeper dive reports every month or every quarter. We like to make data driven decisions, so not only is it vital for the client to see performance, but it also helps us assess whether the relevant strategy is working and what changes we may need to make. To assist around the reporting for Chinese platforms in particular, we have built software which sends automated bespoke reports to clients upon request. This is a powerful tool for clients, and can be set to provide automated metrics reports on daily, weekly or monthly basis. We also offer Asia Digital auditory services for non-retained clients. So if you want us to take a look at how your brand is being talked about online in an Asian market, or just want a second opinion on your current content strategy, we can provide the right digital audit services for you. There is no doubt that Asia is a growing sponsorship market. In recent years we have seen bodies such as FIFA and UEFA sign significant sponsorship deals with Chinese brands in particular. This dovetails with the trend of the great sports market in China, and the desire of Chinese companies to internationalise themselves. If you are a sports rights holder looking for sponsors in Asia, we offer prospecting services to try and help you make the best match. Equally, if you are looking to break into a priority Asian market – and believe that sport is the right tool – we have a roster of recommended events and sponsorship opportunities in Asia that we’d be more than happy to discuss with you. Experiential marketing is about turning your fans into your advocates. Red Lantern organises labelled events in Asia to engage fans and customers on a deeper level, ultimately making them advocates for your brand. From exclusive film screenings to fan festivals, we organise events that engage and inspire. Fans and customers in Asia are no longer satisfied with just engaging with you via their mobile phones. They want to get the opportunity to live your events in person and then share that experience with their friends and family. A key part of your fan acquisition strategy needs to be backing up a consistent and delightful digital strategy with the opportunity to engage with offline events. Consultancy is a vague word, in our experience it means something different to everyone. From our point of view, we provide market intelligence and advice. Whether it’s setting out a potential of social media strategy for Japan, or checking on a commercial opportunity that may have come your way from China. Our team of experts will offer the best advice we can.